2018 Marathon Des Sables. Photo © Josuef Photo, Valentin Campagnie, Alexis Berg for Cimbaly MDS 2018. 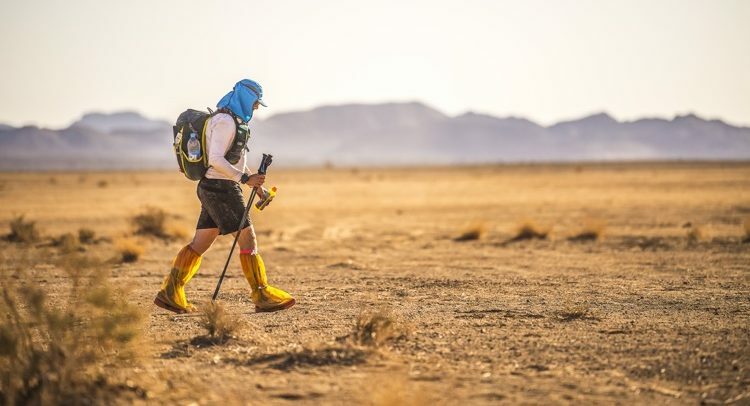 The Marathon Des Sables is long (6 stages, 7 days) and exhausting: 155 miles on average each year, with temperatures always in the 90s – we’ve been through warmer conditions more than once, and one year even had 122 degrees during the entire 26-mile marathon stage. One thing that some people still don’t know about is that participants have to be almost entirely self-sufficient. Almost entirely? Yes, the only thing race management gives you is water, more or less, every six miles. All the rest you must carry in your 14-33 pound backpack. Here are my last-minute tips regarding gear for the 34th Marathon Des Sables (MDS). Please note that even if I’ve named a few brands and have worn them in the past, I will continue to do so in this year’s race, but I’m not sponsored by any of them. Remember to always go with what works for you but following last minute advice may not be completely foolish. Since it’s a race where experience matters more than general rules, I’ve asked my dear friend and fellow competitor Jay Batchen to step in and offer you his own insights as well. Jay is a 12-time MDS finisher, and he has been the representative for the USA contingent since 2004. You may have been told to buy a special desert hat, with protective UPF sun protection fabric on the neck and sides. But I’ve always found a regular trucker will do the trick. It’s probably more ventilated and it’s also light. Boco trucker hats are popular among endurance athletes and that’s what I’m going to be using again: they’re simply the lightest I’ve found. As long as you thoroughly and regularly apply a strong, water-resistant high SPF sunscreen that doesn’t run, you’ll be fine. For sunscreen, what works best is what the surfers use. My favorite is Headhunter face stick (spf 45) that you’ll find in surf shops. Other face and body sticks like Neutrogena (spf 70) and Coppertone Sport (spf 50) will also work well, and you’ll find them pretty much everywhere. All are also really convenient to carry with you. Jay Batchen: I’ve never worn a hat with the flaps that cover my neck – those bother me, especially during sandstorms. I do wear a Buff around my neck and pull it up over my face when necessary. For sunscreen, I bring single-use packets (All Good or Elta) before each stage and a small SPF 50 stick of Mychelle to apply during the run (but most of my skin is covered – see below). My fiancée and I had a light fight last night because she’s coming to the MDS but refuses to wear sunglasses. “But I don’t like sunglasses!” she yelled. I told her how dangerous not wearing protective eyewear at all times during the day would be. Any running sunglasses will work, but lighter, fatter and darker are the best, in my opinion. The Sahara sun is brutal and the sand is a reflective surface, which can reflect most of the damaging sun rays. I’ve used Oakley and Smith in the past and they both served me well. One important addition is a pair of goggles. In case of a sandstorm (and they are more common than you think) you’ll remember this. A $40 L-Frame® MX Oakley motocross goggle works just fine. That’s what I’ve been wearing for years. Jay Batchen: Sunglasses should be compulsory, to save your eyes from both the sun and the sand storms. I’ve worn many brands in the desert (Julbo, Smith, Oakley, Native) but keep coming back to Wiley-X because they offer light-adjusting lenses and a removable gasket that provides extra protection during sandstorms. The light-adjusting lenses also allow me to wear them during nighttime sandstorms. As much as I love Injinji and as much as I’ve always been touched by the story of brothers Randuz and Joaquin Romay behind it, I don’t think Injinji are a good fit for Marathon Des Sables. I even think that they can be a very bad idea. During the race, because of the extra salt tablets, the heat and also because of all the pounding you endure, your feet will expand a bit. Sometimes, if you get a blister—and a lot of runners do—they will expand drastically. Consequently, because of all the tape around your toes (and the substantial pain) you will not be able to fit your toes into toe socks. I strongly recommend using any other running sock that you are comfortable with and carry two pairs. A good idea is to carry a larger second pair. Because, again: your feet will get bigger. Jay Batchen: I’ve used two pairs of Smartwool socks every year, always starting out with a mid-weight version for the first three stages, and then going with a fresh pair of the lightweight version for the long stage (and rest of the race). I fill the socks with Blister Shield powder to help prevent blisters. Take two sizes larger than your usual running shoes, because for the same reasons as above, chances are that you will end this race with very different looking feet than when you started. The shoe will be too big on the first stages but that’s fine – just insert one or two pairs of internal soles. I believe it’s not too late to change your running shoes as long as you can deal with the sewing and gluing of the velcro gaiter around the shoe. Better to have brand new shoes of your favorite model two sizes bigger, than tested comfy shoes your feet will not fit in after 3-4 of those Sahara days. I know this sounds crazy, but trust me, I’ve been there and had to cut half of my favorite shoes with my Swiss army knife to be able to fit my feet in. I finished the race…walking the last three stages. Not fun. Consequently, the brand I strongly recommend if you can bear the zero drop, is Altra. This is because Altra shoes are naturally wider in the toe box and this is what you need out there. My local running shop didn’t carry a size 12 so I’m going with Hoka this year. Not because it’s originally a French brand, but because they have an oversize cushioning that will probably do wonders. Jay Batchen: I’ve seen many people try to use shoes that don’t work for their needs, simply because others say they will work in the desert. Road or trail specific doesn’t really matter, so go with what works best. Over the years, I’ve used Asics, Brooks, Montrail and New Balance, but the cushioning of the Hoka makes the weekly pounding less painful. (The Sahara is more rock and hardpack than sand.) Sizing up a half-size has served me well, and sometimes I’ll opt for a ‘wider’ option. Ultimately, the gaiter system is most important…gluing Velcro to the shoes WILL NOT work – it has to be sewn onto the shoe. Four rules of last-minute advice: 1) Don’t under-estimate the effect of heat and exhaustion on your desire to eat. You will not be hungry. Every year, 80% of the MDS runners end up throwing away a lot of the food they’ve been carrying for days. How pointless is that? The 2,000 calorie race regulation is high. You actually don’t need that much food. 2) Please vary: Eat dehydrated foods, but mix in other things. Sometimes, two bars can be a mid-day meal, especially on the first three short stages. 3) Repackage all your dehydrated food in small zip lock plastic bags labeled with the name of the food (unless you want to eat couscous for breakfast and oatmeal for dinner). This will save you tons of space. 4) If you plan on carrying gels, the more liquid they are the better. Pretty quickly, after 2-3 days, water will taste boring. Having gels you can gulp without adding water is a relief. Jay Batchen: I feel I’ve tried many of the typical ‘ultra’ fuels and drink mixes out there, but what works for me is bringing a wide variety of food options and keeping it simple. In the extreme heat, I do not crave sweet items, so I opt for things I don’t typically eat while running: chips, nuts, jerky, etc. I usually start a stage with a gel, then move onto GU Chomps and Waffles during the run; ginger chews have also been a life saver. I seldom use drink mixes after the first two stages but do find that tea bags and bouillon cubes can hit the spot in the lukewarm water distributed at the checkpoints. Words I live by: if it tastes bad during training, it will taste worse during the race. Most of you will find this useless, but it’s my only luxury in this race. I like to be able to use my GPS watch and listen to music continuously through the week. That’s just me. I’ve been carrying Goal Zero Nomad for a few years. A sandstorm destroyed my older one last year when I left it unattended in the middle of the night, so I just bought a new one. 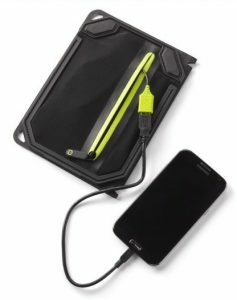 The panel you want should be easy to fix on your backpack.